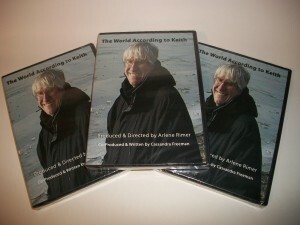 DVD – World According to Keith | Reelstar Media Inc.
Reelstar Media Inc. has worked on a number of projects, including the following Documentary shown on Bravo!, Knowledge Network, Canadian Learning Television and Book Television. The World According to Keith, Keith Johnstone that is, the father of Improv! An irreverant and revealing look at the life, work and art of Keith Johnstone, master of improvisation and inventor of Theatresports(tm) who has influenced, comedy, theatre, television and entertainment around the globe. His visionary ideas influenced television hits such as Kids in the Hall and Whose Line Is It Anyway? The one hour documentary features Keith Johnstone, Mark McKinney (Kids in the Hall), who started as a student of Johnstone in Calgary; Colin Mochrie (This Hour has 22 Minutes), who began his career in Vancouver’s Theatresports troupe and Wayne Brady (The Wayne Brady Show). Home Use – EDITION FOR HOME USE ONLY – BUY NOW through PayPal accepting all major credit cards. For educational sales and public performance see below. Prices include shipping, handling and taxes(if applicable). Total Cost is only $39.95/copy which includes Limited Edition DVD with case($29.95) plus shipping, handling and applicable taxes(if any). Select your item and country area (Canada, USA, International) of delivery from cart list below, a new window will open and your can select the quantity desired. For USA, or International, or Education use (Libraries or Schools), see below! Wholesale price available for quantities orders. Contact orders at orders@improvwiz.com 1-647-933-4195 or select 10 pack below. We are happy to announce that we can offer a special 30% discount on orders of 10 or more. Cost is only $209.65/case of 10 DVD’s Limited Edition DVD with case ($209.65=(10 x 29.95 – 30%)) plus $39.95 for shipping, handling and applicable taxes(if any). Select your item and country area (Canada, USA, International) of delivery from cart list below, a new window will open and your can select the quantity desired. Canada Library Use – Total Cost is only $259.95/copy which includes Limited Edition DVD with case plus shipping, handling and applicable taxes(if any). Lending to individuals for personal, home use. Illegal for classroom or instructional purposes of any kind. Select your item and country area (Canada, USA, International) of delivery from cart list below, a new window will open and your can select the quantity desired. Canada Single School Use – Price is $289.95/copy which includes Limited Edition DVD with case, shipping, handling and applicable taxes(if any). : Includes Public Performance Copyright (for classroom and institutional use) for one school only. Not for circulation to other schools in your district K – 12 Schools Only. Select your item and country area (Canada, USA, International) of delivery from cart list below, a new window will open and your can select the quantity desired. Canada Media Centre Circulation Copyright – Price is $449.95/copy which includes Limited Edition DVD with case, shipping, handling and applicable taxes(if any). : Includes Public Performance Copyright (for classroom and institutional use). Includes the right to circulate within a school district or post secondary institution. Select your item and country area (Canada, USA, International) of delivery from cart list below, a new window will open and your can select the quantity desired. USA Institutional Copyright – Price is $199.95/copy which includes Limited Edition DVD with case, shipping, handling and applicable taxes(if any). : Includes Public Performance Copyright (for classroom and institutional use) Includes the right to circulate within a school district or post secondary institution. Select your item and country area (Canada, USA, International) of delivery from cart list below, a new window will open and your can select the quantity desired. International Library Use – Price is $259.95/copy which includes Limited Edition DVD with case, shipping, handling and applicable taxes(if any). : Lending to individuals for personal, home use. Illegal for classroom or instructional purposes of any kind. Select your item and country area (Canada, USA, International) of delivery from cart list below, a new window will open and your can select the quantity desired. International Single School Use – Price is $289.95/copy which includes Limited Edition DVD with case, shipping, handling and applicable taxes(if any). : Includes Public Performance Copyright (for classroom and institutional use) for one school only. Not for circulation to other schools in your district K – 12 Schools Only. Select your item and country area (Canada, USA, International) of delivery from cart list below, a new window will open and your can select the quantity desired. Purchaser is responsible for any duties/taxes/levies imposed by their country of purchase. Order will be processed through Reelstar Media Inc.